We make quilts for all High Schools and Colleges. They can be made from T-Shirts or fabrics. If you would like a T-Shirt Quilt made from your shirts/sweatshirts, please refer to the T-Shirt page for the corresponding information. 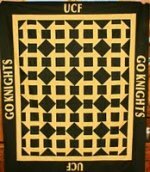 School quilts can be crafted using a design of your choice, as well as fabrics in your school colors. Jersey Girl Quilts is not licensed to use the logos for schools and colleges, but we can, however, use fabric that has been designed and licensed by your educational institution. Below you will find examples of the different design choices available. We use color and print appropriate fabrics to make your school memories live on and on in these special quilts. While we cannot promise to use the exact same fabrics on each quilt due to availabilty, the color tones of the quilt will be as close to the original on the site as possible. We are happy to email you a sample of the fabric to be used if you would like. This could delay your quilt being made and therefore should be programed into the return time if you are planning on the quilt as a gift for a special occasion. This is a fancier quilt block made in the schools colors. We add the schools name to it for more recognition. The back of this quilt would be made from the front fabric. If you want to do the front in the solid fabrics and the back in the licensed fabric that can be done as well if the fabric is available. Size is approximately 52"x 62"
This design can be made with the schools colors and/or with the licensed fabric from the school. If you want to do the front in the solid fabrics of the school colors and the back in the licensed fabric that can be done if the fabric is available. Otherwise the back will have the same colors as the front. I can also add the school name as in the quilt to the left. 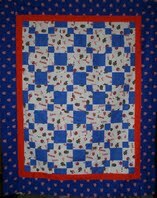 Size is approximately 62" x 72"
This is a school quilt that is made with fabric in the schools colors. You pick the colors and I will make your quilt. I can add the schools name as in the quilt above. The back of this quilt would compliment the front with the same colors on it. Size is approximately 48" x 60"
This is the same quilt design as the one on the left but is made with the schools licensed fabric and plain fabric. The back of this quilt would also have a school fabric on it as well. 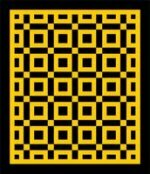 If you would like to see some more designs you can use for your quilt go to Greek Quilts or click here.